Automatically peel as you pull. Are ready to use, no moistening required. Stick them on invoices, shirtbands, packages, etc. 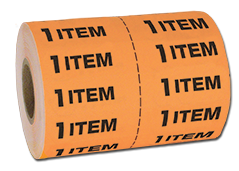 Packed in a dispenser box - 1,000 labels per box. Label size: 5/8" x 1"
Custom printing available. Minimum 5 boxes. Delay 30-45 days for special manufacture. Provided with black ink on red permanent adhesive paper. Packed in a dispenser box. 250 labels per box. Label size: 5/8" x 4"
Please Note: not designed to be put on garments. Dispenser for the 1 Item Sticker Roll. Made with heavy gauge metal. 3-part consecutively numbered receipt. Packed 200 per box. Receipt size: 8 1/2" x 7 3/4"